Next > peace. and love. pass it on. And is that a piece of litter I see in the foreground? Carin, the black and white you’ve rendered this in so perfectly expresses the feeling of the scene, a valiant stubborn desolation is what it conveys to me (have not yet read other comments: truly adding more words of mine here would be superfluous — this poignant image says it all. There’s nothing poisonous about this relationship! More seriously, what suggestion resides in this photo and how perfectly you’ve framed the people off to the side. I see a sense of nostalgia – that last early fall evening on the beach, a parting perhaps. 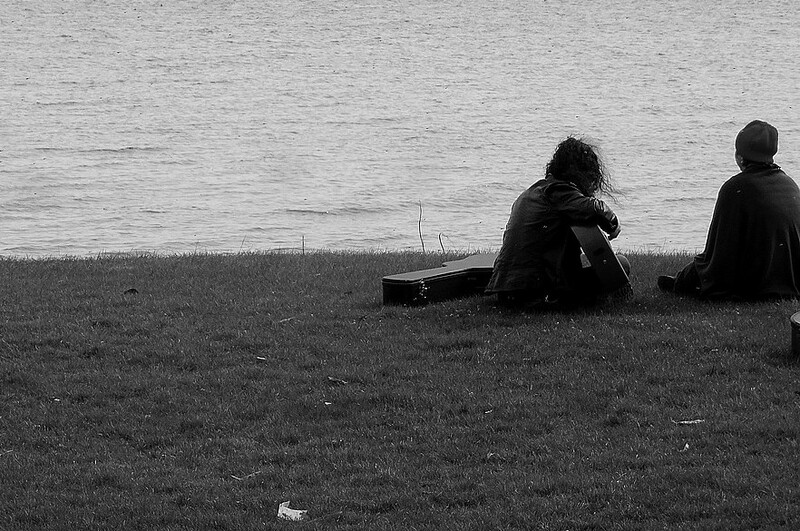 One of them brought their guitar perhaps with lighter thoughts in mind but now, maybe we should just sit awhile? Oh you! The theme, yes! Or… it could be that the relationship has ‘been’ poisoned and he’s trying to get it back…?? Or he’s wooing her with a ballad and will follow it with a plate of sauteed mushrooms! That aside, it really is a nostalgic thing. Who does this anymore? It was a joy to see. Ahhhh comes to mind. Ahhhh’s to the setting and people and music. Perfect tonal quality, too, Carin. This brings back many memories of long ago, and not all terribly happy ones. To me there’s something lonely about it even though there are two of them: the black and white, the way it’s framed, the mown lawn, the faces turned away. But I’m probably projecting. This is not a criticism of th photo though – it’s enormously evocative, haunting even. It’s interesting to me that it does inspire so many different things. Happy memories, or not. Easy to read the sadness here. And yet others immediately feel a sense of peace. That in itself is extraordinary to me. I’m delighted for your ‘projection’! It’s the whole reason I post pictures… to find out what others see. Always so enjoy your thoughtful comments.